The ice2sea MISMIP3d intercomparison is a two-horizontal-dimensional extension of the flowline case described above. As before, in MISMIP3d the grounding line position and its reversibility under changes of physical parameters is analyzed. Instead of changing the ice softness, however, the spatial distribution and magnitude of basal friction is adjusted between experiments. The applied basal friction perturbation of the basal friction is a localized gaussian “bump” and thus a curved grounding line is obtained. In contrast to the flowline experiments, no (semi-)analytical solutions are available to compare to the numerical results. and the results are published in . A complete set of MISMIP3d experiments consists of three runs: Firstly, a flowline solution on a linearly-sloped bed, similar to the flowline MISMIP experiments of the previous section, is run into a steady state (“standard experiment Stnd”). Then the localized sliding perturbation is applied (“perturbation experiment”) causing the grounding line to shift and lose symmetry. Two different amplitudes of the perturbation are considered (“P10” and “P75”). Finally, beginning from the final state of the perturbation experiment, the sliding perturbation is removed and the system is run again into steady state (“reversibility experiment”). The resulting geometry, in particular the grounding line position, is expected to be close to that of the standard experiment. Expecting such reversibility assumes that a particular stationary ice geometry only depends on its physical parameters and boundary conditions and not on how it is dynamically reached. to see a usage message. A README.md gives a tutorial on how to use createscript.py and do the runs themselves. PISM participated in the MISMIP3d intercomparison project  using version pism0.5, and the exact results can be reproduced using that version. PISM’s results, and the role of resolution and the new subgrid grounding line interpolation scheme are discussed in . We observed a considerable improvement of the results with respect to the absolute grounding line positions compared to other models (e.g. the FE reference model Elmer/Ice) and to the reversibility when applying the subgrid grounding line interpolation method; see Fig. 23. Furthermore, we observed that only using SSA yields almost the same results as the full hybrid SIA+SSA computation for the MISMIP3D (and also the MISMIP) experiments, but, when not applying the SIA computation, after a considerably shorter computation time (about 10 times shorter). We explain the small and almost negligible SIA velocities for the MISMIP(3D) experiments with the comparably small ice surface gradients in the MISMIP3d ice geometries. See Fig. 24 for a comparison of SSA and SIA velocities in the MISMIP3D geometry. Note that both Figures Fig. 23 and Fig. 24 were generated with resolution of \(\Delta x = \Delta y = 1\) km. Fig. 23 Comparison between the grounding lines of the higher-amplitude (“P75”) MISMIP3d experiments performed with PISM when using the subgrid grounding line interpolation method (left) or not using it (right). In both cases the SIA+SSA hybrid is used. Fig. 24 The SIA velocities are negligible in the MISMIP3d standard experiment (“Stnd”). The steady state ice geometry is plotted (black) together with the computed SSA velocity (red) and SIA velocity (blue). 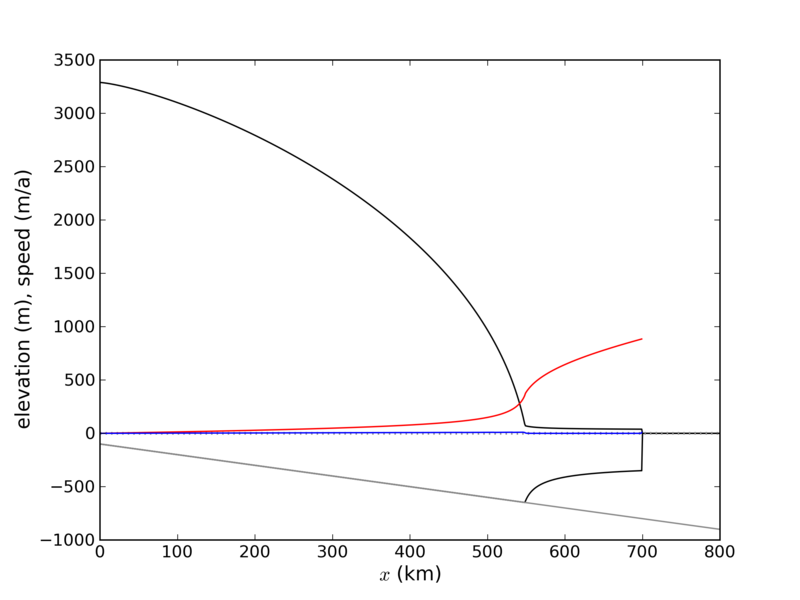 The SIA velocity reaches its maximum value of about \(10\) m/a at the grounding line, about two orders of magnitude less than the maximum of the SSA velocity.